I can't believe how much these little creatures poop! We completely cleaned their container. First was transferring them to a temporary home (ice cream bucket with more thistles). That part wasn't too bad. Then we took the container outside and dumped out everything. We used the hose to wash and dry the container and then put in fresh thistles, borage, dandelion leaves and sticks. By the next morning, there was poop everywhere again! How can these small creatures create so much waste? At least that explains why we need to keep adding leaves. We have noticed that they are starting to slow down. It looks like they might be getting ready for the chrysalis stage. Some of them have headed to the roof and are just hanging out. This page contains a single entry from the blog posted on April 26, 2007 4:32 PM. 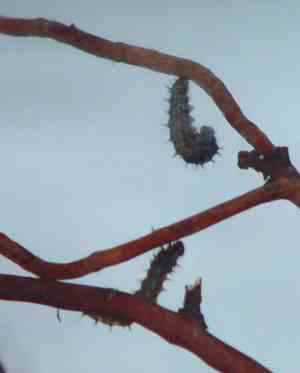 The previous post in this blog was Watching Caterpillars. The next post in this blog is Tadpoles Arrive.